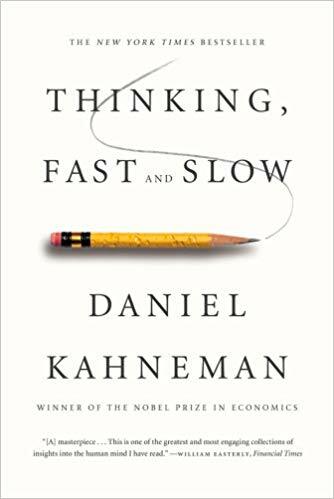 This is a widely-cited, occasionally mind-bending work from Daniel Kahneman that describes many of the human errors in thinking that he and others have discovered through their psychology research. This book has influenced many, and can be considered one of the most significant books on psychology (along with books like Influence), in recent years. Should be read by anyone looking to improve their own decision-making, regardless of field (indeed, most of the book is applicable throughout daily life). Valid intuitions develop when experts have learned to recognize familiar elements in a new situation and to act in a manner that is appropriate to it. The essence of intuitive heuristics: when faced with a difficult question, we often answer an easier one instead, usually without noticing the substitution. We are prone to overestimate how much we understand about the world and to underestimate the role of chance in events. Overconfidence is fed by the illusory certainty of hindsight. My views on this topic have been influenced by Nassim Taleb, the author of The Black Swan. I describe System 1 as effortlessly originating impressions and feelings that are the main sources of the explicit beliefs and deliberate choices of System 2. The automatic operations of System 1 generate surprisingly complex patterns of ideas, but only the slower System 2 can construct thoughts in an orderly series of steps. Detect that one object is more distant than another. Orient to the source of a sudden sound. Focus on the voice of a particular person in a crowded and noisy room. Count the occurrences of the letter a in a page of text. Check the validity of a complex logical argument. It is the mark of effortful activities that they interfere with each other, which is why it is difficult or impossible to conduct several at once. One of the tasks of System 2 is to overcome the impulses of System 1. In other words, System 2 is in charge of self-control. The best we can do is a compromise: learn to recognize situations in which mistakes are likely and try harder to avoid significant mistakes when the stakes are high. People, when engaged in a mental sprint, become effectively blind. As you become skilled in a task, its demand for energy diminishes. Talent has similar effects. It is now a well-established proposition that both self-control and cognitive effort are forms of mental work. Several psychological studies have shown that people who are simultaneously challenged by a demanding cognitive task and by a temptation are more likely to yield to the temptation. People who are cognitively busy are also more likely to make selfish choices, use sexist language, and make superficial judgments in social situations. A few drinks have the same effect, as does a sleepless night. Baumeister’s group has repeatedly found that an effort of will or self-control is tiring; if you have had to force yourself to do something, you are less willing or less able to exert self-control when the next challenge comes around. The phenomenon has been named ego depletion. The evidence is persuasive: activities that impose high demands on System 2 require self-control, and the exertion of self-control is depleting and unpleasant. Unlike cognitive load, ego depletion is at least in part a loss of motivation. After exerting self-control in one task, you do not feel like making an effort in another, although you could do it if you really had to. In several experiments, people were able to resist the effects of ego depletion when given a strong incentive to do so. Restoring glucose levels can have a counteracting effect to mental depletion. Priming effects take many forms. If the idea of EAT is currently on your mind (whether or not you are conscious of it), you will be quicker than usual to recognize the word SOUP when it is spoken in a whisper or presented in a blurry font. And of course you are primed not only for the idea of soup but also for a multitude of food-related ideas, including fork, hungry, fat, diet, and cookie. Priming is not limited to concepts and words; your actions and emotions can be primed by events of which you are not even aware, including simple gestures. Money seems to prime individualism: reluctance to be involved with, depend on, or accept demands from others. Note: the effects of primes are robust but not necessarily large; likely only a few in a hundred voters will be affected. Cognitive ease: no threats, no major news, no need to redirect attention or mobilize effort. Cognitive strain: affected by both the current level of effort and the presence of unmet demands; requires increased mobilization of System 2. Memories and thinking are subject to illusions, just as the eyes are. Predictable illusions inevitable occur if a judgement is based on an impression of cognitive ease or strain. A reliable way to make people believe in falsehoods is frequent repetition, because familiarity is not easily distinguished from truth. If you want to make recipients believe something, general principle is to ease cognitive strain: make font legible, use high-quality paper to maximize contrasts, print in bright colours, use simple language, put things in verse (make them memorable), and if you quote, make sure it’s an easy name to pronounce. Weird example: stocks with pronounceable tickers do better over time. Mood also affects performance: happy moods dramatically improve accuracy. Good mood, intuition, creativity, gullibility and increased reliance on System 1 form a cluster. At the other pole, sadness, vigilance, suspicion, an analytic approach, and increased effort also go together. A happy mood loosens the control of System 2 over performance: when in a good mood, people become more intuitive and more creative but also less vigilant and more prone to logical errors. We can detect departures from the norm (even small ones) within two-tenths of a second. Jumping to conclusions is efficient if the conclusions are likely to be correct and the costs of an occasional mistake acceptable, and if the jump saves much time and effort. Jumping to conclusions is risky when the situation is unfamiliar, the stakes are high, and there is no time to collect more information. The operations of associative memory contribute to a general confirmation bias. When asked, "Is Sam friendly?" different instances of Sam’s behavior will come to mind than would if you had been asked "Is Sam unfriendly?" A deliberate search for confirming evidence, known as positive test strategy, is also how System 2 tests a hypothesis. Contrary to the rules of philosophers of science, who advise testing hypotheses by trying to refute them, people (and scientists, quite often) seek data that are likely to be compatible with the beliefs they currently hold. If you like the president’s politics, you probably like his voice and his appearance as well. The tendency to like (or dislike) everything about a person—including things you have not observed—is known as the halo effect. To counter, you should decor relate error - in other words, to get useful information from multiple sources, make sure these sources are independent, then compare. The principle of independent judgments (and decorrelated errors) has immediate applications for the conduct of meetings, an activity in which executives in organizations spend a great deal of their working days. A simple rule can help: before an issue is discussed, all members of the committee should be asked to write a very brief summary of their position. The measure of success for System 1 is the coherence of the story it manages to create. The amount and quality of the data on which the story is based are largely irrelevant. When information is scarce, which is a common occurrence, System 1 operates as a machine for jumping to conclusions. WYSIATI: What you see is all there is. Overconfidence: As the WYSIATI rule implies, neither the quantity nor the quality of the evidence counts for much in subjective confidence. The confidence that individuals have in their beliefs depends mostly on the quality of the story they can tell about what they see, even if they see little. Framing effects: Different ways of presenting the same information often evoke different emotions. The statement that the odds of survival one month after surgery are 90% is more reassuring than the equivalent statement that mortality within one month of surgery is 10%. Base-rate neglect: Recall Steve, the meek and tidy soul who is often believed to be a librarian. The personality description is salient and vivid, and although you surely know that there are more male farmers than male librarians, that statistical fact almost certainly did not come to your mind when you first considered the question. We often generate intuitive opinions on complex matters by substituting the target question with a related question that is easier to answer. The present state of mind affects how people evaluate their happiness. affect heuristic: in which people let their likes and dislikes determine their beliefs about the world. Your political preference determines the arguments that you find compelling. If you like the current health policy, you believe its benefits are substantial and its costs more manageable than the costs of alternatives. A random event, by definition, does not lend itself to explanation, but collections of random events do behave in a highly regular fashion. Large samples are more precise than small samples. Small samples yield extreme results more often than large samples do. The strong bias toward believing that small samples closely resemble the population from which they are drawn is also part of a larger story: we are prone to exaggerate the consistency and coherence of what we see. Our predilection for causal thinking exposes us to serious mistakes in evaluating the randomness of truly random events. The phenomenon we were studying is so common and so important in the everyday world that you should know its name: it is an anchoring effect. It occurs when people consider a particular value for an unknown quantity before estimating that quantity. What happens is one of the most reliable and robust results of experimental psychology: the estimates stay close to the number that people considered—hence the image of an anchor. The anchoring measure would be 100% for people who slavishly adopt the anchor as an estimate, and zero for people who are able to ignore the anchor altogether. The value of 55% that was observed in this example is typical. Similar values have been observed in numerous other problems. Powerful anchoring effects are found in decisions that people make about money, such as when they choose how much to contribute to a cause. In general, a strategy of deliberately "thinking the opposite" may be a good defense against anchoring effects, because it negates the biased recruitment of thoughts that produces these effects. The availability heuristic, like other heuristics of judgment, substitutes one question for another: you wish to estimate the size of a category or the frequency of an event, but you report an impression of the ease with which instances come to mind. Substitution of questions inevitably produces systematic errors. You can discover how the heuristic leads to biases by following a simple procedure: list factors other than frequency that make it easy to come up with instances. Each factor in your list will be a potential source of bias. Resisting this large collection of potential availability biases is possible, but tiresome. You must make the effort to reconsider your impressions and intuitions by asking such questions as, "Is our belief that thefts by teenagers are a major problem due to a few recent instances in our neighborhood?" or "Could it be that I feel no need to get a flu shot because none of my acquaintances got the flu last year?" Maintaining one’s vigilance against biases is a chore—but the chance to avoid a costly mistake is sometimes worth the effort. The difficulty of coming up with more examples surprises people, and they subsequently change their judgement. The affect heuristic is an instance of substitution, in which the answer to an easy question (How do I feel about it?) serves as an answer to a much harder question (What do I think about it?). Experts sometimes measure things more objectively, weighing total number of lives saved, or something similar, while many citizens will judge “good” and “bad” types of deaths. An availability cascade is a self-sustaining chain of events, which may start from media reports of a relatively minor event and lead up to public panic and large-scale government action. The Alar tale illustrates a basic limitation in the ability of our mind to deal with small risks: we either ignore them altogether or give them far too much weight—nothing in between. In today’s world, terrorists are the most significant practitioners of the art of inducing availability cascades. Psychology should inform the design of risk policies that combine the experts’ knowledge with the public’s emotions and intuitions. The representativeness heuristic is involved when someone says "She will win the election; you can see she is a winner" or "He won’t go far as an academic; too many tattoos." One sin of representativeness is an excessive willingness to predict the occurrence of unlikely (low base-rate) events. Here is an example: you see a person reading The New York Times on the New York subway. Which of the following is a better bet about the reading stranger? She does not have a college degree. Representativeness would tell you to bet on the PhD, but this is not necessarily wise. You should seriously consider the second alternative, because many more nongraduates than PhDs ride in New York subways. The second sin of representativeness is insensitivity to the quality of evidence. There is one thing you can do when you have doubts about the quality of the evidence: let your judgments of probability stay close to the base rate. Anchor your judgment of the probability of an outcome on a plausible base rate. When you specify a possible event in greater detail you can only lower its probability. The problem therefore sets up a conflict between the intuition of representativeness and the logic of probability. conjunction fallacy: when people judge a conjunction of two events to be more probable than one of the events in a direct comparison. Representativeness belongs to a cluster of closely related basic assessments that are likely to be generated together. The most representative outcomes combine with the personality description to produce the most coherent stories. The most coherent stories are not necessarily the most probable, but they are plausible, and the notions of coherence, plausibility, and probability are easily confused by the unwary. An important principle of skill training: rewards for improved performance work better than punishment of mistakes. This proposition is supported by much evidence from research on pigeons, rats, humans, and other animals. The general rule is straightforward but has surprising consequences: whenever the correlation between two scores is imperfect, there will be regression to the mean. If the correlation between the intelligence of spouses is less than perfect (and if men and women on average do not differ in intelligence), then it is a mathematical inevitability that highly intelligent women will be married to husbands who are on average less intelligent than they are (and vice versa, of course). Some intuitions draw primarily on skill and expertise acquired by repeated experience. The rapid and automatic judgements of chess masters, fire chiefs, and doctors illustrate these. Others, which are sometimes subjectively indistinguishable from the first, arise from the operation of heuristics that often substitute an easy question for the harder one that was asked. We are capable of rejecting information as irrelevant or false, but adjusting for smaller weaknesses in the evidence is not something that System 1 can do. As a result, intuitive predictions are almost completely insensitive to the actual predictive quality of the evidence. Start with an estimate of average GPA. Determine the GPA that matches your impression of the evidence. Estimate the correlation between your evidence and GPA. If the correlation is .30, move 30% of the distance from the average to the matching GPA. From Taleb: narrative fallacy: our tendency to reshape the past into coherent stories that shape our views of the world and expectations for the future. As a result, we tend to overestimate skill, and underestimate luck. Once humans adopt a new view of the world, we have difficulty recalling our old view, and how much we were surprised by past events. Outcome bias: our tendency to put too much blame on decision makers for bad outcomes vs. good ones. This both influences risk aversion, and disproportionately rewarding risky behaviour (the entrepreneur who gambles big and wins). At best, a good CEO is about 10% better than random guessing. We often vastly overvalue the evidence at hand; discount the amount of evidence and its quality in favour of the better story, and follow the people we love and trust with no evidence in other cases. The illusion of skill is maintained by powerful professional cultures. Experts/pundits are rarely better (and often worse) than random chance, yet often believe at a much higher confidence level in their predictions. A number of studies have concluded that algorithms are better than expert judgement, or at least as good. The research suggests a surprising conclusion: to maximize predictive accuracy, final decisions should be left to formulas, especially in low-validity environments. More recent research went further: formulas that assign equal weights to all the predictors are often superior, because they are not affected by accidents of sampling. The important conclusion from this research is that an algorithm that is constructed on the back of an envelope is often good enough to compete with an optimally weighted formula, and certainly good enough to outdo expert judgment. Intuition can be useful, but only when applied systematically. Select some traits required for success (six is a good number). Try to ensure they are independent. Make a list of questions for each trait, and think about how you will score it from 1-5 (what would warrant a 1, what would make a 5). Collect information as you go, assessing each trait in turn. Then add up the scores at the end. Chapter 22: Expert Intuition: When Can We Trust It? When both these conditions are satisfied, intuitions are likely to be skilled. Whether professionals have a chance to develop intuitive expertise depends essentially on the quality and speed of feedback, as well as on sufficient opportunity to practice. Among medical specialties, anesthesiologists benefit from good feedback, because the effects of their actions are likely to be quickly evident. In contrast, radiologists obtain little information about the accuracy of the diagnoses they make and about the pathologies they fail to detect. Anesthesiologists are therefore in a better position to develop useful intuitive skills. The inside view: when we focus on our specific circumstances and search for evidence in our own experiences. Also: when you fail to account for unknown unknowns. The outside view: when you take into account a proper reference class/base rate. The outside view is implemented by using a large database, which provides information on both plans and outcomes for hundreds of projects all over the world, and can be used to provide statistical information about the likely overruns of cost and time, and about the likely underperformance of projects of different types. Identify an appropriate reference class (kitchen renovations, large railway projects, etc.). Obtain the statistics of the reference class (in terms of cost per mile of railway, or of the percentage by which expenditures exceeded budget). Use the statistics to generate a baseline prediction. Use specific information about the case to adjust the baseline prediction, if there are particular reasons to expect the optimistic bias to be more or less pronounced in this project than in others of the same type. Organizations face the challenge of controlling the tendency of executives competing for resources to present overly optimistic plans. A well-run organization will reward planners for precise execution and penalize them for failing to anticipate difficulties, and for failing to allow for difficulties that they could not have anticipated—the unknown unknowns. Danger: losing track of reality and underestimating the role of luck, as well as the risk involved. The procedure is simple: when the organization has almost come to an important decision but has not formally committed itself, Klein proposes gathering for a brief session a group of individuals who are knowledgeable about the decision. The premise of the session is a short speech: "Imagine that we are a year into the future. We implemented the plan as it now exists. The outcome was a disaster. Please take 5 to 10 minutes to write a brief history of that disaster." theory-induced blindness: once you have accepted a theory and used it as a tool in your thinking, it is extraordinarily difficult to notice its flaws. It’s clear now that there are three cognitive features at the heart of prospect theory. They play an essential role in the evaluation of financial outcomes and are common to many automatic processes of perception, judgment, and emotion. They should be seen as operating characteristics of System 1. Evaluation is relative to a neutral reference point, which is sometimes referred to as an "adaptation level." For financial outcomes, the usual reference point is the status quo, but it can also be the outcome that you expect, or perhaps the outcome to which you feel entitled, for example, the raise or bonus that your colleagues receive. Outcomes that are better than the reference points are gains. Below the reference point they are losses. A principle of diminishing sensitivity applies to both sensory dimensions and the evaluation of changes of wealth. The third principle is loss aversion. When directly compared or weighted against each other, losses loom larger than gains. This asymmetry between the power of positive and negative expectations or experiences has an evolutionary history. Organisms that treat threats as more urgent than opportunities have a better chance to survive and reproduce. The “loss aversion ratio” has been estimated in several experiments and is usually in the range of 1.5 to 2.5. Endowment effect: for certain goods, the status quo is preferred, particularly for goods that are not regularly traded or for goods intended “for use” - to be consumed or otherwise enjoyed. Note: not present when owners view their goods as carriers of value for future exchanges. The brain responds quicker to bad words (war, crime) than happy words (peace, love). If you are set to look for it, the asymmetric intensity of the motives to avoid losses and to achieve gains shows up almost everywhere. It is an ever-present feature of negotiations, especially of renegotiations of an existing contract, the typical situation in labor negotiations and in international discussions of trade or arms limitations. The existing terms define reference points, and a proposed change in any aspect of the agreement is inevitably viewed as a concession that one side makes to the other. Loss aversion creates an asymmetry that makes agreements difficult to reach. The concessions you make to me are my gains, but they are your losses; they cause you much more pain than they give me pleasure. Whenever you form a global evaluation of a complex object—a car you may buy, your son-in-law, or an uncertain situation—you assign weights to its characteristics. This is simply a cumbersome way of saying that some characteristics influence your assessment more than others do. The conclusion is straightforward: the decision weights that people assign to outcomes are not identical to the probabilities of these outcomes, contrary to the expectation principle. Improbable outcomes are overweighted—this is the possibility effect. Outcomes that are almost certain are underweighted relative to actual certainty. When we looked at our choices for bad options, we quickly realized that we were just as risk seeking in the domain of losses as we were risk averse in the domain of gains. Certainty effect: at high probabilities, we seek to avoid loss and therefore accept worse outcomes in exchange for certainty, and take high risk in exchange for possibility. Possibility effect: at low probabilities, we seek a large gain despite risk, and avoid risk despite a poor outcome. Indeed, we identified two reasons for this effect. First, there is diminishing sensitivity. The sure loss is very aversive because the reaction to a loss of $900 is more than 90% as intense as the reaction to a loss of $1,000. The second factor may be even more powerful: the decision weight that corresponds to a probability of 90% is only about 71, much lower than the probability. Many unfortunate human situations unfold in the top right cell. This is where people who face very bad options take desperate gambles, accepting a high probability of making things worse in exchange for a small hope of avoiding a large loss. Risk taking of this kind often turns manageable failures into disasters. The probability of a rare event is most likely to be overestimated when the alternative is not fully specified. Emotion and vividness influence fluency, availability, and judgments of probability—and thus account for our excessive response to the few rare events that we do not ignore. Adding vivid details, salience and attention to a rare event will increase the weighting of an unlikely outcome. When this doesn’t occur, we tend to neglect the rare event. Broad framing was obviously superior in this case. Indeed, it will be superior (or at least not inferior) in every case in which several decisions are to be contemplated together. Decision makers who are prone to narrow framing construct a preference every time they face a risky choice. They would do better by having a risk policy that they routinely apply whenever a relevant problem arises. Familiar examples of risk policies are "always take the highest possible deductible when purchasing insurance" and "never buy extended warranties." A risk policy is a broad frame. Agency problem: when the incentives of an agent are in conflict with the objectives of a larger group, such as when a manager continues investing in a project because he has backed it, when it’s in the firms best interest to cancel it. Sunk-cost fallacy: the decision to invest additional resources in a losing account, when better investments are available. Disposition effect: the preference to end something on a positive, seen in investment when there is a much higher preference to sell winners and “end positive” than sell losers. An instance of narrow framing. People expect to have stronger emotional reactions (including regret) to an outcome produced by action than to the same outcome when it is produced by inaction. To inoculate against regret: be explicit about your anticipation of it, and consider it when making decisions. Also try and preclude hindsight bias (document your decision-making process). Also know that people generally anticipate more regret than they will actually experience. You should make sure to keep a broad frame when evaluating something; seeing cases in isolation is more likely to lead to a System 1 reaction. The framing of something influences the outcome to a great degree. For example, your moral feelings are attached to frames, to descriptions of reality rather than to reality itself. Another example: the best single predictor of whether or not people will donate their organs is the designation of the default option that will be adopted without having to check the box. We tend to overrate the end of an experience when remembering the whole. Generally: we tend to ignore the duration of an event when evaluating an experience. Confusing experience with the memory of it is a compelling cognitive illusion—and it is the substitution that makes us believe a past experience can be ruined. One way to improve experience is to shift from passive leisure (TV watching) to active leisure, including socializing and exercising. The second-best predictor of feelings of a day is whether a person did or did not have contacts with friends or relatives. Can money buy happiness? Being poor makes one miserable, being rich may enhance one’s life satisfaction, but does not (on average) improve experienced well-being. Severe poverty amplifies the effect of other misfortunes of life. The satiation level beyond which experienced well-being no longer increases was a household income of about $75,000 in high-cost areas (it could be less in areas where the cost of living is lower). The average increase of experienced well-being associated with incomes beyond that level was precisely zero. Experienced well-being is on average unaffected by marriage, not because marriage makes no difference to happiness but because it changes some aspects of life for the better and others for the worse (how one’s time is spent). One reason for the low correlations between individuals’ circumstances and their satisfaction with life is that both experienced happiness and life satisfaction are largely determined by the genetics of temperament. A disposition for well-being is as heritable as height or intelligence, as demonstrated by studies of twins separated at birth. The importance that people attached to income at age 18 also anticipated their satisfaction with their income as adults. The people who wanted money and got it were significantly more satisfied than average; those who wanted money and didn’t get it were significantly more dissatisfied. The same principle applies to other goals—one recipe for a dissatisfied adulthood is setting goals that are especially difficult to attain. Measured by life satisfaction 20 years later, the least promising goal that a young person could have was "becoming accomplished in a performing art." Miswanting: bad choices that arise from errors of affective forecasting; common example is the focusing illusion causing us overweight the effect of purchases on our future well-being. Rationality is logical coherence—reasonable or not. Econs are rational by this definition, but there is overwhelming evidence that Humans cannot be. An Econ would not be susceptible to priming, WYSIATI, narrow framing, the inside view, or preference reversals, which Humans cannot consistently avoid. The definition of rationality as coherence is impossibly restrictive; it demands adherence to rules of logic that a finite mind is not able to implement. The assumption that agents are rational provides the intellectual foundation for the libertarian approach to public policy: do not interfere with the individual’s right to choose, unless the choices harm others. Thaler and Sunstein advocate a position of libertarian paternalism, in which the state and other institutions are allowed to nudge people to make decisions that serve their own long-term interests. The designation of joining a pension plan as the default option is an example of a nudge. The way to block errors that originate in System 1 is simple in principle: recognize the signs that you are in a cognitive minefield, slow down, and ask for reinforcement from System 2. Organizations are better than individuals when it comes to avoiding errors, because they naturally think more slowly and have the power to impose orderly procedures. Organizations can institute and enforce the application of useful checklists, as well as more elaborate exercises, such as reference-class forecasting and the premortem. At least in part by providing a distinctive vocabulary, organizations can also encourage a culture in which people watch out for one another as they approach minefields. The corresponding stages in the production of decisions are the framing of the problem that is to be solved, the collection of relevant information leading to a decision, and reflection and review. An organization that seeks to improve its decision product should routinely look for efficiency improvements at each of these stages. There is much to be done to improve decision making. One example out of many is the remarkable absence of systematic training for the essential skill of conducting efficient meetings. Ultimately, a richer language is essential to the skill of constructive criticism. Decision makers are sometimes better able to imagine the voices of present gossipers and future critics than to hear the hesitant voice of their own doubts. They will make better choices when they trust their critics to be sophisticated and fair, and when they expect their decision to be judged by how it was made, not only by how it turned out.